Former Czech President Vaclav Havel has opened an international conference in Prague on promoting democracy in Cuba. He told delegates that Cuba's situation would change soon and that opponents to Fidel Castro's 45-year rule should prepare for the end of "dictatorship". The meeting is also attended by former Spanish Prime Minister Jose Maria Aznar and former Latin American leaders. A Cuban diplomat told the BBC that the US was behind the event, which she called an unwanted meddling. 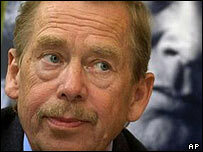 In the 1970s and 1980s Mr Havel was one of the most prominent dissidents within Europe's communist bloc. He was in office for 12 years after the collapse of communism in the former Czechoslovakia in 1989. Analysts say there is a strong feeling of solidarity towards Cuba's present-day dissidents in European countries that peacefully overthrew communism. Mr Havel said a free, post-Castro Cuba should take inspiration from the experience of eastern Europe. "Some will be surprised to have so much freedom after all these years of communism and to have so much weight on their shoulders," he told delegates. The Prague meeting is being organised by the International Committee for Democracy in Cuba, founded by Mr Havel a year ago. The conference comes 18 months after a crackdown against dissent by the Castro government that drew international condemnation. Among the 75 dissident jailed at the time is prominent Cuban poet Paul Rivero.